As some of you may remember, many moons ago I worked as a film critic for a well known print publication (which shall remain nameless, to protect the innocent, namely ME). And I've done a lot of Press Screenings. In the beginning the Private Screening Rooms and Snacks were impressive (I started pretty young so often times I was the youngest journalist in the room), the Press Junkets and meeting the celebs were fun (I actually have a scrapbook with my clippings), but I think The Moms have finally finished creating a Movie Monster in me with their most recent Screening Experience! 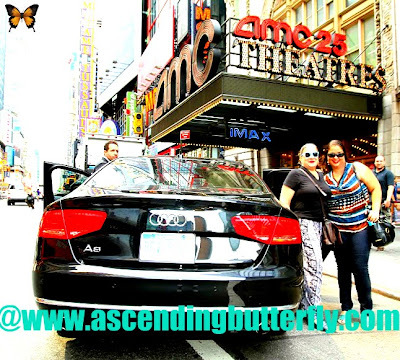 Check out Team Butterfly peeking out from behind the passenger side of the 2014 Audi A8! When an Audi A8 and a driver show up at your door to take you into the city for a film screening you know it's going to be EPIC! First of all I have to tell you that it was the smoothest ride I've ever experienced, I love New York City, but anyone who has visited as well as locals know, there are A LOT of potholes, I mean A LOT, and while riding in the Audi A8 the very first thing I noticed was just how smooth the ride is. I know where most of the potholes are by heart and know when to brace myself (especially when I'm in a yellow cab) but this car ride was absolutely the smoothest I've ever experienced, and my driver was awesome too! I'm not sure I want to go any screening that doesn't come with Audi ride to and from my door after this! Team Butterfly outside AMC 25 Movie Theatre in New York City, check out the super hot 2014 Audi A8 Automobile and there is my super cool driver! Seriously folks if you are considering a new vehicle, look no further, the 2014 Audi A8 is pure perfection! The Audi quattro all-wheel drive system is super smooth, it's LED lighting, Audi MMI touch technology, Audi MMI Navigation plus with voice control system, and absolutely gorgeous interior, make this vehicle pure perfection as far as I'm concerned! I will be dreaming of this car for quite awhile! I looked great as a passenger, but I'm thinking I'd look even better behind the wheel! But I digress! Despite how amazing the ride is, the true star of the show was the movie of course, The Wolverine! Lured to a Japan he hasn't seen since World War II, century-old mutant Wolverine (Played by Hugh Jackman) finds himself in a shadowy realm of Yakuza and Samurai. Wolverine is pushed to his physical and emotional brink when he is forced to go on the run with a powerful industrialist's daughter (Played by Tao Okamoto) and is confronted - for the first time - with the prospect of his own death. As he struggles to re-discover the hero within himself, he must grapple with powerful foes and the ghosts of his own haunted past. In every movie there is a scene stealer, and for me, The Wolverine's scene stealer, is Rila Fukushima who plays Yukio who becomes a 'body guard' for Wolverine/Logan, it's an understated yet very well delivered performance! I don't want include any spoilers, but I will tell you don't pop up when the credits start to roll, stay put and pay attention, something cool happens, but I won't tell you what, you'll just have to go check that out for yourself to find out what it is! All I can say is....the plot thickens my friends! This is definitely a summer must see! It's action-packed and has great visuals, there is something that has always fascinated me about Japanese culture and the scenes there are visually beautiful to watch and certainly make me want to go visit. 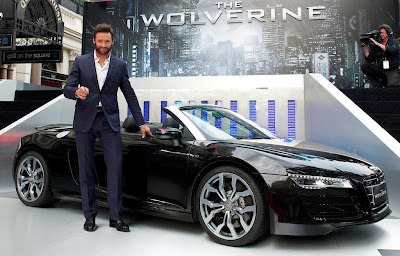 Hugh couldn't have been nicer and the Audi A8 ride to and from the theatre was smooth and fantastic! As we were leaving we were treated to cupcakes by Baked By Melissa, they used 1,700 cupcakes and they spelled out the word 'The Wolverine' with the chocolate ones which I thought was pretty cool! Even 'The Wolverine' can't resist cupcakes, NOM! NOM! NOM! Butterflies, The Wolverine is a definite 'TICKET', once you've seen it, come back here and let us know what you thought! FTC Disclosure: This is NOT a Sponsored Post, no monetary compensation has been received in exchange for our event recap coverage. We were provided with Roundtrip Transportation to and from the Theatre compliments of Audi. We were provided with a private screening experience courtesy of The Moms. All opinions are 100% my own. See our full disclosure policy for any questions. I love Hugh Jackman! So sorry I missed this, but I can't wait to see it! Now you actually have me wanting to buy a new car too-LOL! Glad you had a good time. @Milena - You would have enjoyed it! It's a definite ticket so check it out when you get a chance! Honestly that Audi was the smoothest car ride I've ever had, It's now on my wishlist for sure! That's awesome you got access to the Hugh. @Jeffrey Nelson - The Moms always host amazing entertainment events, but this one by far has to be the best one! Hugh was super personable! 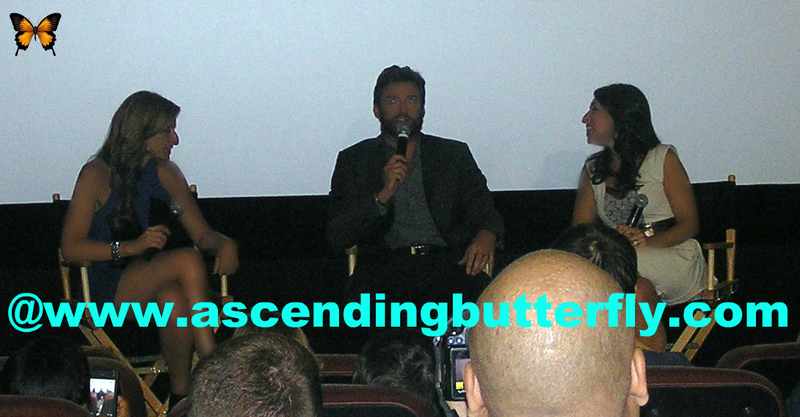 The Wolverine is a total must see! Great summer action movie. Eeeep! I need to see it ASAP!!! @erikitty - Definitely! Put this movie on your must see list! Wow!! Looks like such a fun event!! We are huge Marvel Fans so this is on our list of must sees!! @Maria - I will admit this one definitely stands out as my favorite private movie screening event of the year! Let me know what you guys thought after you've seen it! I've been enjoying your LSU posts!